Heat the oil in a small saucepan over medium heat. Add the Leek & Garlic and cook for 3 minutes, stirring constantly until the Leek softens. In an oven-proof dish approx. 2L in capacity. place 1/3 of the sliced potato evenly over the base. Top with ½ the Leek & Garlic and ½ the Bacon. Pour over 1/3 of the Cream mixture. Repeat the layering, finishing with the cream on top. Sprinkle with breadcrumbs and Parmesan cheese. 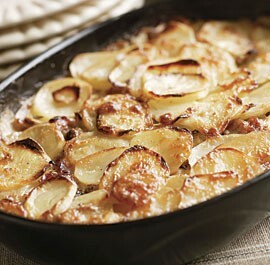 Bake in oven for ½ hour, turn the dish and bake for a further ½ hour or until the potatoes are tender.